Twitterpated – what a funny word! I honestly had never heard the word until SU had some ‘Twitterpated’ dsp a few years back. Okay…I’ll admit it…I have NEVER watched Bambi! 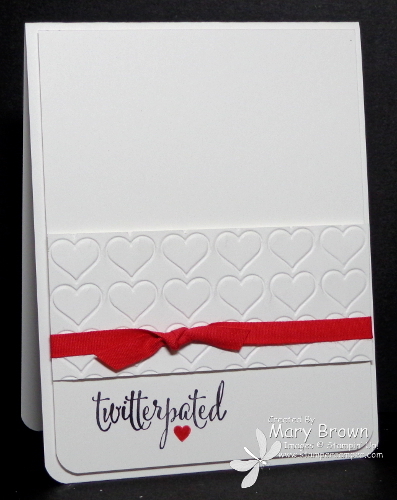 Okay…so back to me card…today is the FIRST DAY of Create with Connie and Mary’s Valentine Mini Collection – 4 tutorials (two card sets, two 3D items) using the You Plus Me set and the Hey, Valentine set. The projects in the collection are for our subscribers only and will not be shown anywhere else. Tie Real Red 1/4″ Cotton Ribbon around panel and add to card front using dimensionals. Yep that really is all there is to this card. Would also be PERFECT as a simple wedding or anniversary card! 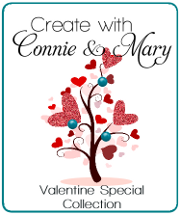 Create with Connie and Mary has just started our Valentine Special MINI Collection 2015! The collection runs Dec 26th through the 29th so that our demo subscribers have plenty of time to set up their classes, but you don’t need to be a demo to join us! Sign up TODAY at Create with Connie and Mary so you don’t miss out! This entry was posted in Clean and Simple (CAS), Create with Connie and Mary, Spring Mini and tagged You Plus Me. Bookmark the permalink.